Nature and landscape in Finland. Location on the map Finland is located in northern Europe.Finland Finlands neighbour in east is Russia, in west Sweden. 2 Location on the map Finland is located in northern Europe.Finland Finlands neighbour in east is Russia, in west Sweden and in south Estonia. Finland is the sixth biggest country in Europe. 5 Living nature and environment The biggest mammals in Finland are wolf, bear, reindeer, wolverine and elk which all live mostly in northern Finland because its so sparsely-populated and the cities are small.bearwolverineelk Wolves and wolverines are endangered and they are protected by laws so that they wont die in extinction. I have never seen bigger mammals except once I saw an elk in Lapland, in northern Finland. 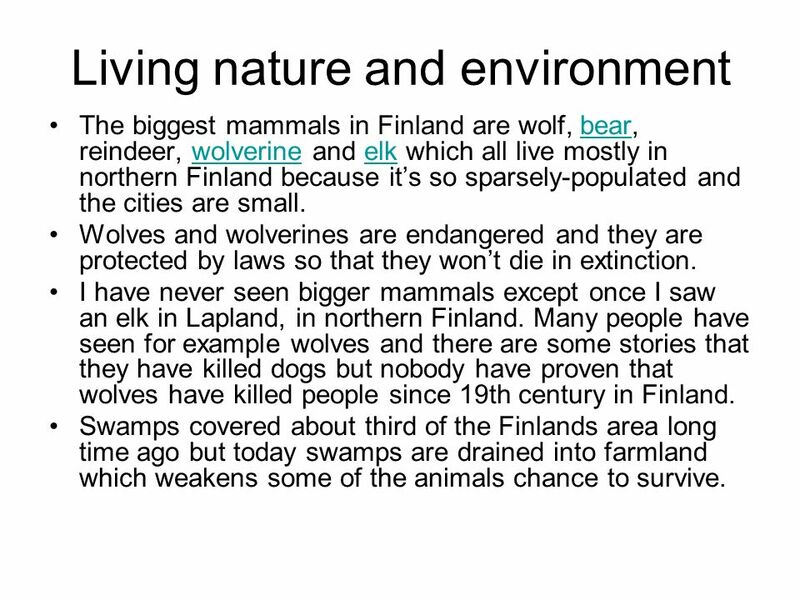 Many people have seen for example wolves and there are some stories that they have killed dogs but nobody have proven that wolves have killed people since 19th century in Finland. Swamps covered about third of the Finlands area long time ago but today swamps are drained into farmland which weakens some of the animals chance to survive. 6 Landscapes The highest fell in Finland is Haltitunturi which is 1324 meters above the sea. 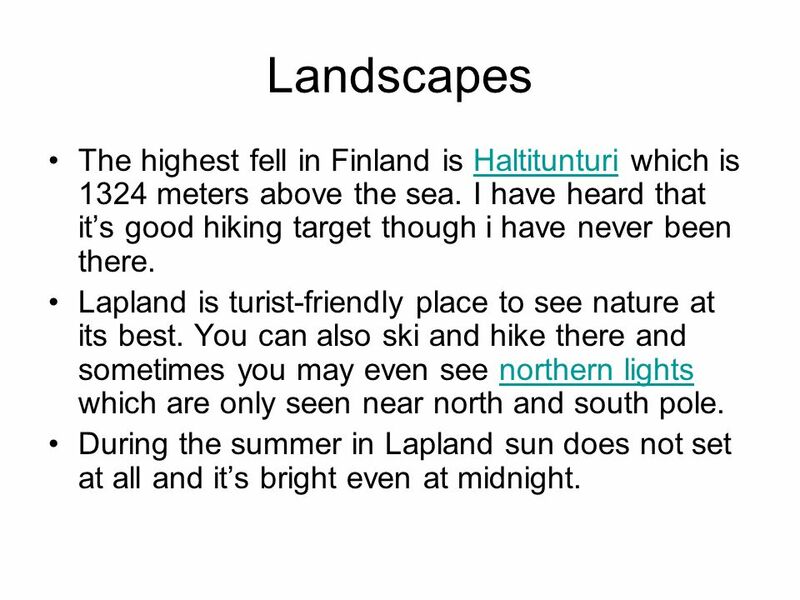 I have heard that its good hiking target though i have never been there.Haltitunturi Lapland is turist-friendly place to see nature at its best. You can also ski and hike there and sometimes you may even see northern lights which are only seen near north and south pole.northern lights During the summer in Lapland sun does not set at all and its bright even at midnight. 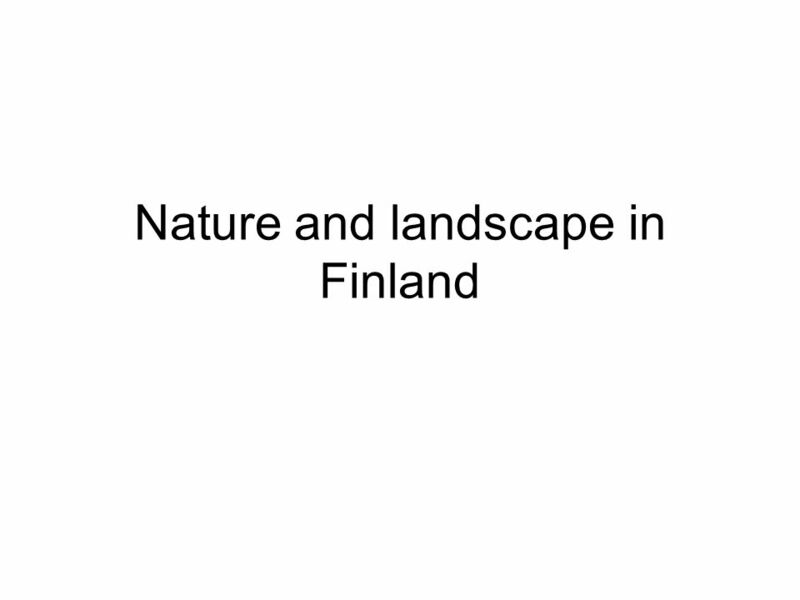 Download ppt "Nature and landscape in Finland. 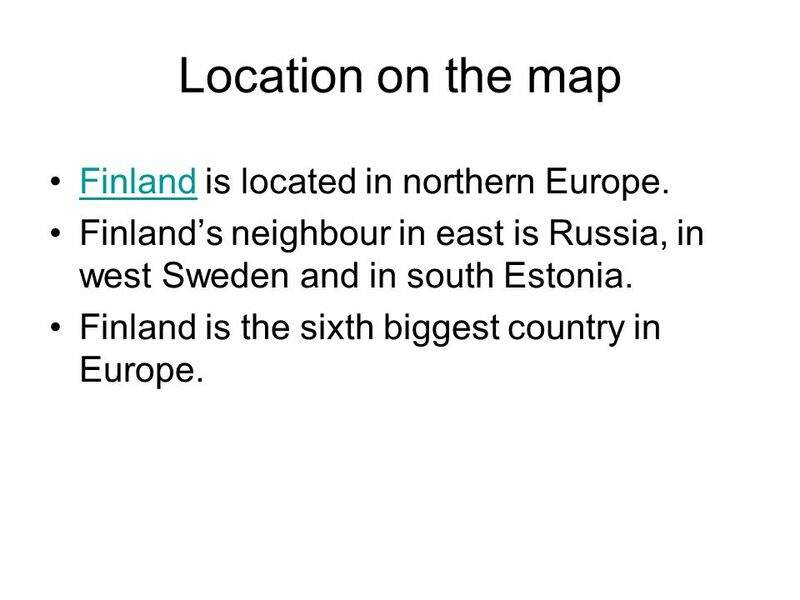 Location on the map Finland is located in northern Europe.Finland Finlands neighbour in east is Russia, in west Sweden." FINLAND Finland is a repuplic. Our president is Sauli Niinistö. Finland is part of the European Union and Scandinavia. Our capital is Helsinki Ahvenanmaa. 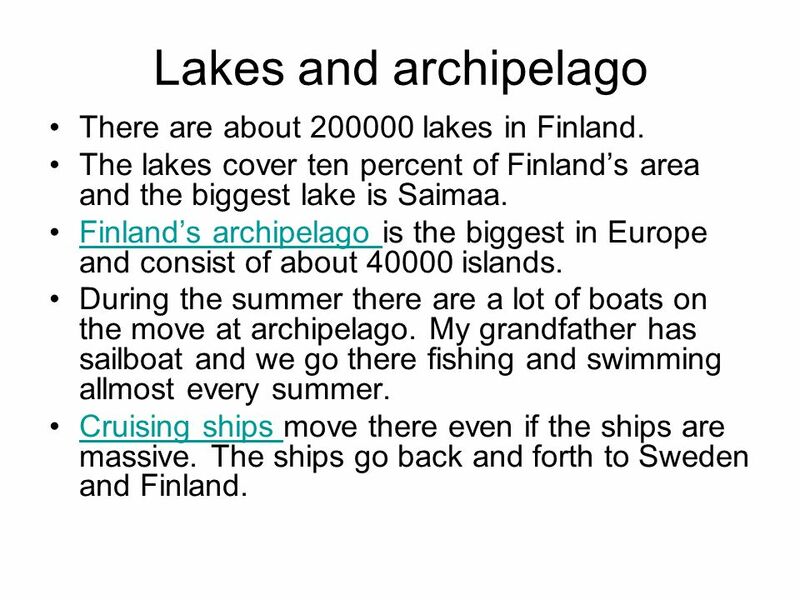 FINLAND  Finland is situated in the northern part of Europe  The population of Finland is 5,4 millions  Our official languages are Finnish and Swedish. A temperate rain forest and were going to see every season and animal here. FINLAND. Neighbour countries: Russia, Norway, Sweden, Estonia 338,145 square kilometres big 5,3 million people Most of the people live in the southern. Finnish Nature Made by Teemu & Ari. Animals Finland has many species of animals. There are more herbivores than carnivores. 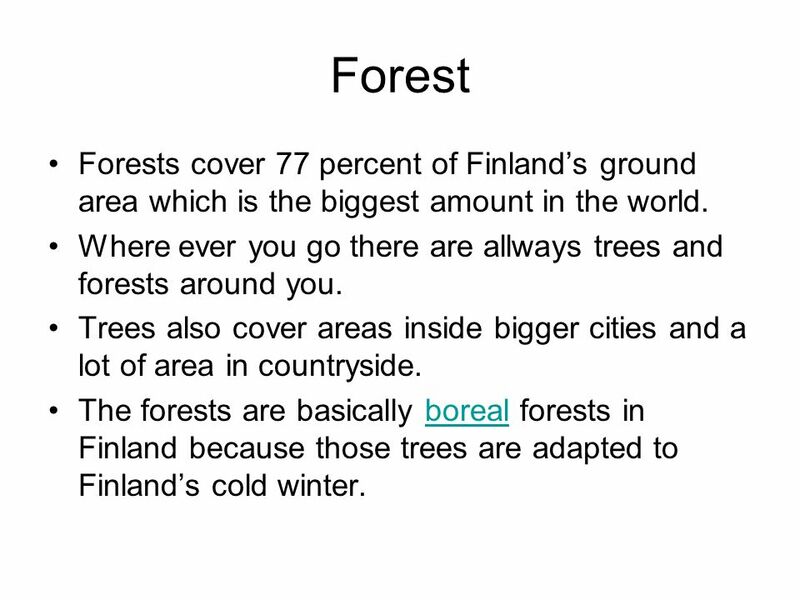 Finland has many species of. Lake Taupo is a beautiful lake near the center of the North Island of New Zealand. Our first week- long timeshare was on the northern edge of the lake.
. Antarctica is a large continent located at the far south of the world. It is larger than Europe. The weather there is very cold. About 98% of Antarctica. Map of Finland Our capital city is here And we live here. Project day at Taivalkoski upper secondary school October 2010. An endangered species By: Zaid Ansari.  Assalamualaikum my name is Zaid Ansari. I would like to apply for the Junior Journalist job for the National. How did the Vikings know where they were going? Navigation in the Viking Age. - Used to live in Britain? - Never lived here?. Constellations Stars as Tools for Navigation  The North Star is called Polaris and located directly above the North Pole. This star appears in the same. Maps Getting to Know Your World!. 4 Elements Of A Map Title – tells you what the map is of Scale – tells distance Compass – tells direction Legend – tells.